I tried a bunch of poke bowls in town and Koa Lua's happens to be the best if you like raw fish with a bang! I like that they proudly make Hawaiian poke because news flash, poke wasn't invented in California. The Union location gets busy pretty fast so come early/late or take it to go. My office is two minutes away so I'm thrilled! Now I must try the whole menu, including that spam appetizer! Sisters Mandy and Rebecca Wolfe are on a roll! Before I even got the chance to revisit their renovated Westmount location, a new location popped up in the middle of the Old Montreal. The new restaurant looks gorgeous and offers a huge dining room (kid friendly too!) with complete table service. The take away counter is also great with lots of space for when it gets busy. So when you say salad, I say Mandy's! Libertine Bakehouse is a brand new bakery and coffee stop on Atwater Avenue. 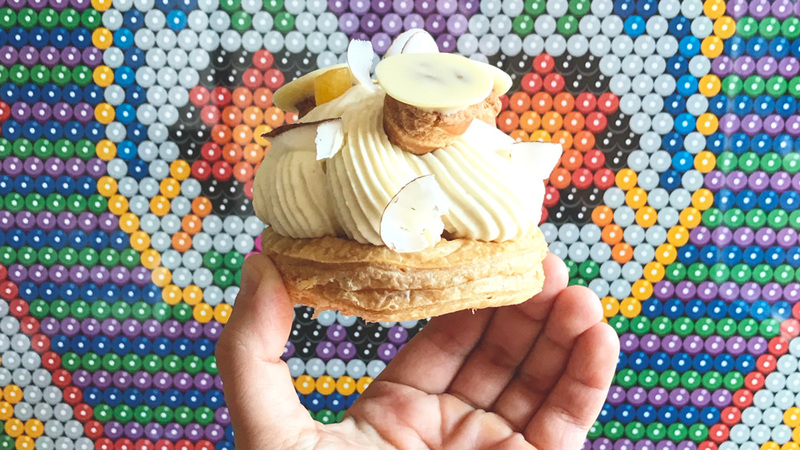 The small location serves a limited selection of pastries that all look like art pieces -- and they also happen to taste like heaven. Kampai Garden is maybe the most popular project that has opened in Le Faubourg Ste-Catherine. The huge beer garden caught my attention because of the collaboration with chef Antonio Park. I tried most dishes on my visit and loved almost every one of them except for the beef tartare with cold sweet potatoes. I think this is a great location if you need to go out with a big group. The food arrives (almost too) quickly, cocktails come in pitchers and it's just a cool location that looks exactly like Apt 200 (I was told it's the same designer). I actually did my internship in that area as a college student and ate a poutine or five at the same location when it was owned by La Belle Province. It was weird to go in and end up in a small dining room having seen how big it was in the past but they also have a bar (I refuse to call easy to find bars speakeasies, sorry). Once you get over the fact that it will be quite a challenge to get to that single bathroom stall, there's nothing bad to say about Foiegwa. The service is outstanding and the food is as delicious (even more!) than it sounds on the menu. Order a plate of pancakes to share if you go for brunch, you can thank me later. I think every neighbourhood should have a banh mi counter so I couldn't wait to try BÃ¡nh MÃ¬ BÃ nh Yiu in Mile-End. I think the ratio of filling/bread could be improved to eat something more fresh and tasty but it didn't stop me from leaving quite satisfied. I also really like the dep area in the back so you can pick up a drink or snack while you're at it. Ok, I'm cheating a little bit (a lot) with Boucherie Lawrence because there is nothing new about that counter. I just had to sneak it in this article because that Porchetta sandwich they make is one of the best sandwiches I've ever had, period. It's also a pleasure watching the crew prepare it using ingredients that are all local and found in store to purchase yourself, from the mustard to the bread! Cheers to a lot of good food! Let's do this again soon.